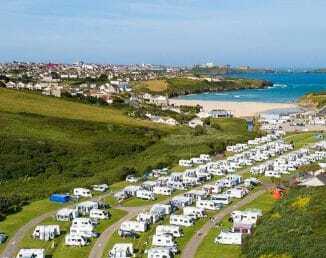 Located just 150 yards from Porth Beach, our holiday park is a popular destination for both families and couples. With a range of accommodation to choose from you can stay in our caravan holiday homes, glamping pods or bring your tent or caravan and come touring and camping on our site! We are only a short drive from the popular resort of Newquay, yet far enough away to avoid the hustle and bustle! This vibrant seaside town is the centre of activity in the summer in this area of North Cornwall and his home to top attractions (such as Newquay Zoo, Blue Reef Aquarium and Pirate’s Quest) and boasts no fewer than 7 magnificent beaches! There’s also plenty of shops, cafes, restaurants and bars to keep you entertained! Our location means we’re only a short distance from some of the most amazing countryside and coastal landscapes in the UK. Based right on the north coast, at our park you can pick up the coast path and walk vast stretches of beach and cliff top. Or, just as easily, you can jump in your car and be in the idyllic port of Padstow or the quaint fishing village of Port Isaac in next to no time! If you love beach holidays then you’ll love a break at our holiday park! Porth Beach is a small cove with a beautiful sandy beach, that’s perfect for sunbathing, having fun or simply building the best sandcastles in Cornwall! And it’s right outside our park entrance! Have you always wanted to try something new? Always wanted to give surfing a go? We’ve teamed up with Blue Surf School to offer lessons to our guests who are just dying to get onto a board and into the water! We have a great range of on-park facilities for our guests. From WiFi and a laundrette to an immaculate shower/toilet block and children’s playground!